Nationals of Australia, Canada and New Zealand can apply for a working holiday visa which allows them to work temporarily, full-time or part-time in Chile for 12 months. This is a type of temporary residency visa. If you want to experience life in Chile but not commit fully to a residency visa, you can apply for a working holiday visa. You must, however, have a valid passport from Canada, Australia or New Zealand. You can apply for this visa in your home country at a Chilean embassy or consulate. You can work part-time or full-time but only for a maximum of six months for the same employer. (You cannot work the full 12 months for the same person). You cannot travel with children, but if you wish to apply with a spouse you must both fill out separate applications forms. The visa does not guarantee employment or housing - the applicant is responsible for finding work and accommodation. Employment shouldn’t be the main reason for this visa. Employment should be used to fund your travels around Chile. There is a yearly quota for this type of visa. Applications open in October for the following year’s quota. Application fee of US$150 (payable in the currency of your country). 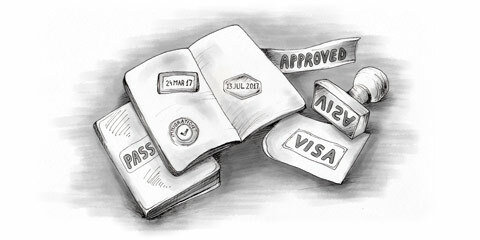 If your application is successful, you will be issued with a certifying letter which grants a temporary residence visa. You have 90 days from the issue date of the letter to enter Chile. The visa is valid 12 months from your entry into Chile. Follow the links for the embassy websites in Canada , Australia and New Zealand for more information.